Infections transmitted by ticks are increasingly recognized as important causes of disease in North American dogs. Veterinarians have been combatting canine bacterial and protozoal tick-borne diseases for decades (Table 1). 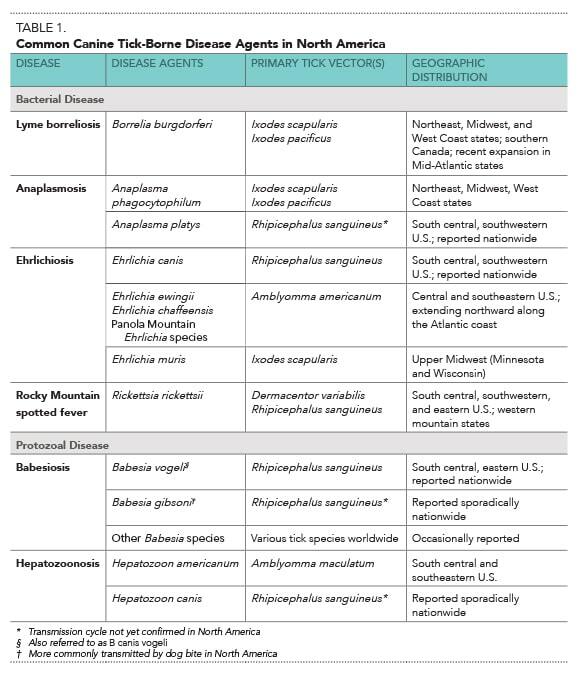 In recent years, however, the geographic range of many of these pathogens has expanded, and several novel infections have been identified, suggesting that the full complement of pathogens transmitted by ticks is more extensive than currently recognized in many regions of North America. All of these infections share a common link: tick transmission. As a result, tick control for dogs is more important than ever. 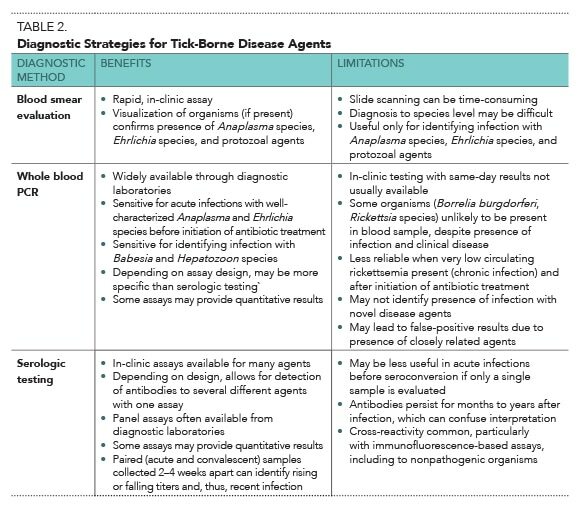 Following is a brief review of diagnosis and treatment of the more common tick-borne infections in dogs, and a description of some newly recognized infections that may become important for canine health in the future. When B burgdorferi is transmitted to dogs in nature, the VlsE protein is expressed, resulting in production of antibodies that react to the C6 peptide. However, antibodies reactive to the C6 peptide are not produced following vaccination for Lyme disease, which provides a way to identify past or current infection in dogs. It is important to note that, even with this specific assay, a positive result indicates past or current infection with B burgdorferi but does not prove clinical disease. A phagocytophilum: Ixodes ticks (I scapularis and I pacificus) are responsible for transmission, and A phagocytophilum infections are most prevalent in the Northeast and upper Midwest. PCR assays are most useful for identifying early, active infections prior to antibiotic treatment. Serologic testing is more likely to confirm established infections. Antibodies can be detected in many dogs during both early and established acute disease. Identification of morulae on blood smears can be readily achieved in many patients, particularly during acute infection. Transmission. Several different Ehrlichia species can infect dogs in the U.S., including E canis (Figure 1), E ewingii, E chaffeensis, Panola Mountain Ehrlichia species, and E muris.6,9,10 Different tick species are responsible for transmitting these Ehrlichia species, resulting in widespread distribution of infection. Presentation. Clinical signs include rapid onset of fever, lethargy, and anorexia. Thrombocytopenia is often present, and some dogs may develop bleeding diatheses. Neurologic complications occur frequently. Clinical disease, although relatively uncommon, is associated with high fatality rates in both humans and dogs, particularly when treatment is delayed or withheld.13 Prompt, aggressive treatment can result in a rapid response, with resolution of clinical signs within a few days. PCR of whole blood is less likely to identify infection with R rickettsii than with Anaplasma or Ehrlichia species. Diagnosis. 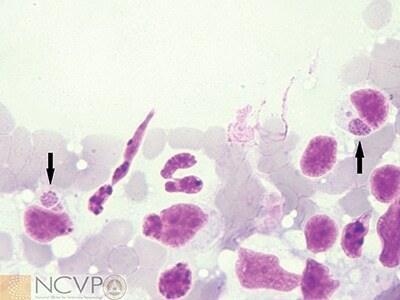 Infection is usually diagnosed by careful examination of stained blood smears for characteristic large (B vogeli) or small (B gibsoni) piroplasms within red blood cells.15 Serologic testing and PCR are also widely available and can be helpful in identifying chronic and acute infections, respectively. Transmission. The most common and severe cause of canine hepatozoonosis in the U.S. is Hepatozoon americanum, transmitted by Amblyomma maculatum primarily in southern states.18 In recent years, H canis has also been identified in the U.S., although this R sanguineus–transmitted pathogen is more common in dogs in South America, Europe, Africa, and Asia. Presentation. Dogs with disease due to H americanum usually present with fever, myalgia, muscle atrophy, and poor body condition. Profound neutrophilia is often present, and periosteal bone proliferation may occur.18 Without treatment, body condition continues to deteriorate and many affected dogs die or are euthanized. Diagnosis. Disease is most commonly diagnosed by whole blood PCR, although gamonts are occasionally found on blood smears (Figure 3). Histologic examination of muscle biopsy specimens is more sensitive than whole blood PCR for diagnosing infection, but less commonly pursued due to the invasive nature of sample collection. Serologic assays to confirm Hepatozoon infection are not available. In addition, viral tick-borne pathogens have been increasingly identified in humans.24,25 Heartland virus and Bourbon virus are 2 examples of recently identified, apparently tick-transmitted pathogens in humans, although neither has yet been described in dogs. Base the decision to treat primarily on your clinical judgment. Use diagnostic results as an adjunct to clinical judgment, but not as the basis for administering or withholding treatment. Withhold treatment if findings on serologic testing or PCR are negative. Do not delay treatment in dogs with clinical disease, particularly rickettsial infections; these patients may be serologically negative at initial presentation and PCR may fail to identify a novel disease agent, but delaying treatment can result in death. Clinical improvement is typically evident within the first week of therapy.6,26 Dogs that do not respond to doxycycline should be carefully re-evaluated for additional etiologic agents. Co-infection with bacterial and protozoal agents is frequent and can be responsible for apparent doxycycline treatment failure in some patients. Treatment recommendations for canine babesiosis and hepatozoonosis vary depending on the specific agent responsible. Infections with large Babesia species, such as B vogeli, can be treated with imidocarb dipropionate, 6 mg/kg IM, with the dose repeated in 14 days. Triple therapy for 14 days with (1) trimethoprim sulfamethoxazole, 15 mg/kg PO Q 12 H; (2) clindamycin, 10 mg/kg PO Q 8 H; and (3) pyrimethamine, 0.25 mg/kg PO Q 24 H.
Regardless of initial therapy choice, dogs with American canine hepatozoonosis should be maintained long-term (2 years or more) on suppressive therapy with decoquinate, 10 to 20 mg/kg PO Q 12 H. Nonsteroidal anti-inflammatory drugs are also useful to improve clinical condition. Little SE, Beall MJ, Bowman DD, et al. 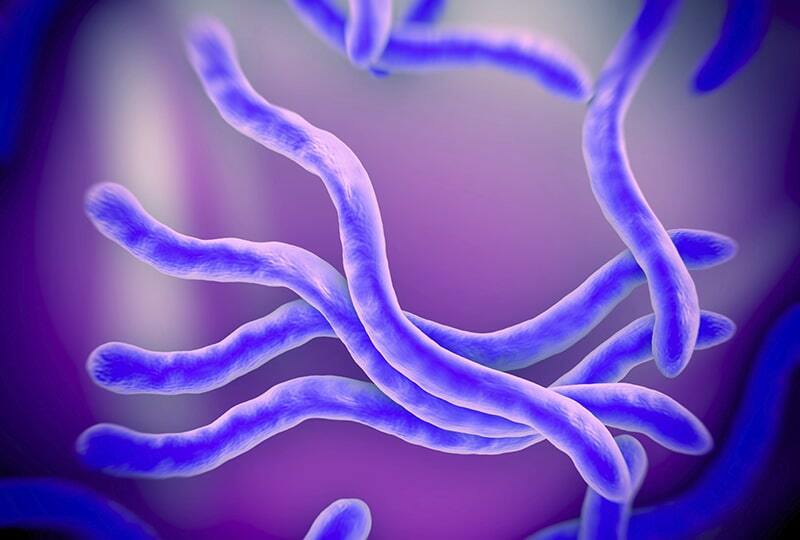 Canine infection with Dirofilaria immitis, Borrelia burgdorferi, Anaplasma spp., and Ehrlichia spp., in the United States, 2010–2012. Parasit Vectors 2014; 7:257. Littman MP, Goldstein RE, Labato MA, et al. ACVIM small animal consensus statement on Lyme disease in dogs: Diagnosis, treatment, and prevention. J Vet Intern Med 2006; 2:422-434. Little SE, Heise SR, Blagburn BL, et al. Lyme borreliosis in dogs and humans in the USA. Trends Parasitol 2010; 26:213-218. Krupka I, Straubinger RK. Lyme borreliosis in dogs and cats: Background, diagnosis, treatment and prevention of infections with Borrelia burgdorferi sensu stricto. Vet Clin North Am Small Anim Pract 2010; 40:1103-1119. Carrade DD, Foley JE, Borjesson DL, et al. Canine granulocytic anaplasmosis: A review. J Vet Intern Med 2009; 23(6):1129-1141. Little SE. Ehrlichiosis and anaplasmosis in dogs and cats. Vet Clin North Am Small Anim Pract 2010; 40(6):1121-1140. Gaunt SD, Beall MJ, Stillman BA, et al. Experimental infection and co-infection of dogs with Anaplasma platys and Ehrlichia canis: Hematologic, serologic, and molecular findings. Parasit Vectors 2010; 3:33. Allison RW, Little SE. Diagnosis of rickettsial diseases in dogs and cats. Vet Clin Pathol 2013; 42(2):127-144. Hegarty BC, Maggi RG, Koskinen P, et al. Ehrlichia muris infection in a dog from Minnesota. J Vet Intern Med 2012; 26(5):1217-1220. Qurollo BA, Davenport AC, Sherbert BM, et al. Infection with Panola Mountain Ehrlichia sp. 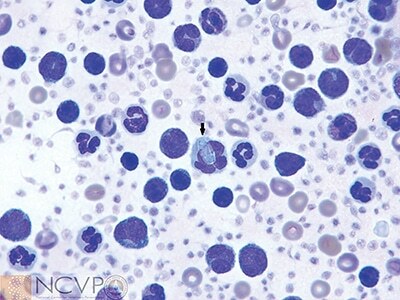 in a dog with atypical lymphocytes and clonal T-cell expansion. J Vet Intern Med 2013; 27(5):1251-1255. Starkey LA, Barrett AW, Beall MJ, et al. Persistent Ehrlichia ewingii infection in dogs after natural tick infestation. J Vet Intern Med 2015; 29(2):552-555. Dahlgren FS, Holman RC, Paddock CD, et al. Fatal Rocky Mountain spotted fever in the United States, 1999-2007. Am J Trop Med Hyg 2012; 86(4):713-719. Barrett A, Little SE, Shaw E. “Rickettsia amblyommii” and R montanensis infection in dogs following natural exposure to ticks. Vector Borne Zoonotic Dis 2014; 14(1):20-25. Irwin PJ. Canine babesiosis. Vet Clin North Am Small Anim Pract 2010; 40(6):1141-1156. Birkenheuer AJ, Correa MT, Levy MG, et al. Geographic distribution of babesiosis among dogs in the United States and association with dog bites: 150 cases (2000-2003). JAVMA 2005; 227(6):942-947. Sikorski LE, Birkenheuer AJ, Holowaychuk MK, et al. 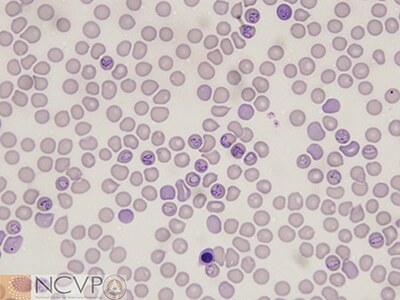 Babesiosis caused by a large Babesia species in 7 immunocompromised dogs. J Vet Intern Med 2010; 24(1):127-131. Allen KE, Johnson EM, Little SE. Hepatozoon spp. infection in the United States. Vet Clin North Am Small Anim Pract 2011; 41:1221-1238. Johnson EM, Panciera RJ, Allen KE, et al. Alternate pathway of infection with Hepatozoon americanum and the epidemiologic importance of predation. J Vet Intern Med 2010; 23:1315-1318. Paddock CD, Finley RW, Wright CS, et al. Rickettsia parkeri rickettsiosis and its clinical distinction from Rocky Mountain spotted fever. Clin Infect Dis 2008; 47:1188-1196. Allen KE, Li Y, Kaltenboeck B, et al. Diversity of Hepatozoon species in naturally infected dogs in the southern United States. Vet Parasitol 2008; 154(3-4):220-225. Cotte V, Bonnet S, Le Rhun D, et al. Transmission of Bartonella henselae by Ixodes ricinus. Emerg Infect Dis 2008; 14(7):1074-1080. Reis C, Cote M, Le Rhun D, et al. Vector competence of the tick Ixodes ricinus for transmission of Bartonella birtlesii. PLoS Negl Trop Dis 2011; 5(5):e1186. doi:10.1371/journal.pntd.0001186. [PMC free article] [PubMed] [Cross Ref]. Pastula DM, Turabelidze G, Yates KF, et al. Notes from the field: Heartland virus disease—United States, 2012-2013. MMWR Morb Mortal Wkly Rep 2014; 63(12):270-271. Kosoy OI, Lambert AJ, Hawkinson DJ, et al. Novel thogotovirus associated with febrile illness and death, United States, 2014. Emerg Infect Dis 2015. doi:10.3201/eid2105.150150. Neer TM, Breitschwerdt EB, Greene RT, Lappin MR. Consensus statement on ehrlichial disease of small animals from the infectious disease study group of the ACVIM, American College of Veterinary Internal Medicine. J Vet Intern Med 2002; 16(3):309-315. Birkenheuer AJ, Levy MG, Breitschwerdt EB. Efficacy of combined atovaquone and azithromycin for therapy of chronic Babesia gibsoni (Asian genotype) infections in dogs. J Vet Intern Med 2004; 18(4):494-498. Lindsay A. Starkey, DVM, PhD, is a veterinarian, parasitologist, and currently the Bayer Resident in Veterinary Parasitology through the National Center for Veterinary Parasitology at Oklahoma State University. She received the AAVP/Merck Outstanding Graduate Student Award and the AAVP/CAPC Graduate Student Award in Zoonotic Disease from the American Association of Veterinary Parasitologists for her dissertational research, which focused on ticks and tick-borne diseases. Dr. Starkey received her DVM and PhD from Oklahoma State University. Susan E. Little, DVM, PhD, Diplomate ACVM (Parasitology), is a veterinarian, parasitologist, and co-director of the National Center for Veterinary Parasitology at Oklahoma State University, where she serves as Regents Professor and the Krull-Ewing Chair in Veterinary Parasitology. She has been recognized for teaching excellence through the Pfizer (Norden) Distinguished Teaching Award and National Student AVMA Excellence in Teaching Award, and for outstanding research through the Pfizer Award for Research Excellence. She received her DVM from Virginia–Maryland College of Veterinary Medicine (Virginia Institute of Technology) and PhD from University of Georgia.